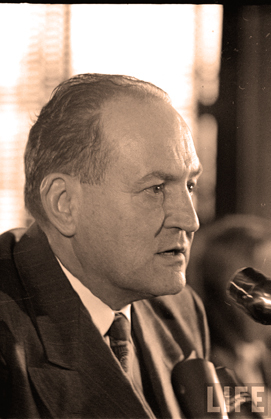 The name Harry Dexter White probably rings no bells today, but in the late 1940's and early 1950's he came to epitomize the Red Scare and Communist infiltration of the U.S. government. White was an Economist and senior official of the Treasury Department, he was a primary participant in the Bretton Woods conference, leading to the formation of the World Monetary Fund and The World Bank. He was a New Deal Democrat and supporter of Roosevelt's ideas on Internationalism as well as the views of vice-President Henry Wallace. White considered himself a Progressive. In 1939, defecting Soviet agent Whittaker Chambers was alleged to have implicated a "Mr. White" as a Soviet agent operating within the government, although there was no confirmation of it at the time and the accusations were considered absurd by even J. Edgar Hoover. However in November of 1945, defecting Soviet agent Elizabeth Bentley implicated White as a source of leaked information to the Soviets and upon further investigation triggered an investigation of White. Meanwhile, Truman had nominated White to direct the International Monetary Fund, which passed the Senate on February 1946. White resigned the position in 1947 shortly after the Attorney General ordered an investigation of Bentley's charges. White was eventually called on to testify and he denied any involvement with the Communist party or any acts of espionage. His testimony would go no further as he suffered a heart attack after the first day of hearings (August 13, 1948) and later died as the result of an overdose of Digitalis (August 16, 1948). Afterward, White was accused of all sorts of espionage (since the dead can rarely defend themselves anyway) and generally considered something of a poster-boy for all things having to do with Communist infiltration of government. Much of it later proved to be untrue, although some documents later discovered in the former Soviet Union did attribute White to some activities, the extent of his espionage was not as ruthless and endangering as originally thought. This interview, from Meet The Press on November 22, 1953 features Chief Counsel for The Senate Internal Security Committee Robert Morris, questioned on the fallout (some five years later) of the Harry Dexter White Affair. As the search for Communists continued.